However, everything changed when they heard about the local clinic that was participating in the Learning for Legs program and providing legs and fittings to amputees at no cost. 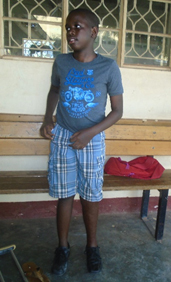 Jeremiah was soon fitted with a leg and now has hope for the future and is looking forward to returning to school with his friends. Benitha is a 4-year-old living in Uganda who was born with only one foot. She is being raised by her single mother Annette who sells tomatoes at a roadside market to support them both. There was no hope of them ever setting aside enough money to pay for a new foot for Benitha. As a result, Annette had to carry Benitha everywhere while trying to make enough money to keep them both alive. All of that changed when Annette brought Benitha to the clinic in Uganda that provide legs and and fittings for free. It took a while for Benitha to get used to the new foot, but she is now walking for the first time in her life thanks to your support. unable to attend school and began falling behind in her studies. Now all of that has changed and the smile on Merceline ’s face says it all. She is now walking to school with her friends.